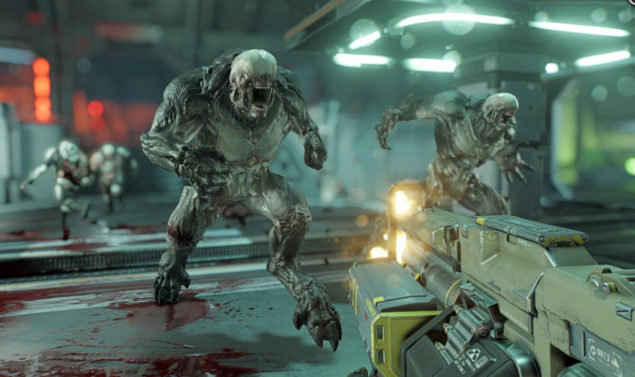 [UPDATE] Bethesda’s VP of PR Pete Hines explained that the leaked benchmarks for the DOOM Alpha on PC aren’t representative of the final performance as optimization wasn’t in place yet. [ORIGINAL STORY ]After a massive twelve year hiatus, a new chapter of DOOM will be released in less than three months from now. Understandably, publisher Bethesda Softworks has released a three-part blog post detailing 22 reasons to love DOOM. Within the last part, there’s also a very interesting section about idTech 6, the new version of the legendary engine that powered DOOM, Quake and many other seminal games. Once upon a time, id Software’s engine was cutting edge in terms of technology. However, idTech 5 largely failed in its purpose and as a result, id Software hired several members of the Crytek tech team when it had the chance, including Lead Rendering Programmer Tiago Sousa. My hope is not a very humble one, but I’d like to help bring idTech back to the forefront of technology once again. His colleague, Lead Project Programmer Billy Khan, added that the team’s goal is for DOOM to be the best looking title running at 1080P@60 (though that mainly refers to consoles, whereas PC gamers should be able to push frame rate and resolution well past those values). We want players to wonder how DOOM and idTech 6 games can be so visually stunning at 60 frames-per-second at 1080p on all platforms, when other titles cannot even achieve a similar look at 30 frames-per-second. Our goal is to be the best-looking game at 1080p at 60fps. We’ll know soon enough if idTech 6 is once again a technological force to be reckoned with. DOOM is scheduled to launch on May 13 for PC, PlayStation 4 and Xbox One; if you’re itching for more, you can take a look at the information datamined from the Alpha here.